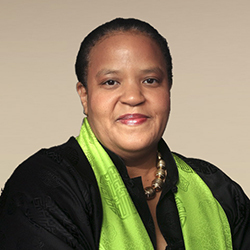 Alissandra Cummins was named President of the International Council of Museums in 2004, after serving as Chairman of the Advisory Committee for six years. She is widely recognized in matters concerning Caribbean heritage, museum development, and art. She is Director of the Museum and Historical Society of Barbados and was elected member of the Museums Association (UK) and was the first person elected in the Caribbean. She teaches Heritage Studies at the University of the West Indies and currently is part of the editorial board of the International Journal of Museum Management and Curatorship. She was instrumental in the creation of the Museums Association of the Caribbean (MAC), becoming President Founder, in 1989. She was also active as the first Board Member and then as President of the International Association for Caribbean Archaeology (IACA). She also served as UNESCO’s Intergovernmental Committee Chair for the Promotion of Return of Cultural Property to Countries of Origin or its Restitution in Case of Illicit Appropriation (ICPRCP), from 2003 to 2005. In 2007, she was appointed President of the International Advisory Board Memory of the UNESCO World Programme. Alissandra was recently chosen to head the delegation of Barbados in the World Heritage Committee. Acting as Special Envoy of Cultural Heritage by the Government of Barbados,she is responsible for technical issues and development policies, and represents the nation at regional and international levels. In 2005, she was awarded the Gold Crown of Merit of Barbados in recognition of her services to the development of heritage and museum.